Sobeys comes back with big discounts ! Today on Sobeys Flyer April 8 2017, there are many big deals on different types of products such as fruits, meats, pork, fish, organic foods and so on ! In Sobeys, you can also have $5 discount coupons so if you have to do shopping for your house needs and want to save some money, today’s Sobeys flyer is the thing that you have to look at. There are also many different and unique products for Easter such as Easter Blossom Cookies, Fresh Wild Halibut Fillets, Strawberry Shortcake and so on. In short, if you are looking for big shopping for get ready to Easter and you also do not want to spend to much money (who wants it right ?) than today’s Sobeys Flyer is just for you ! Now, Lets see the big deals ! Easter is on our doorstep so you might want to do some shopping for get ready. Do not panic, we got you covered. With today’s Sobeys flyer on your hand, you don’t have to fear anything ! Today’s flyer has many good deal and we try our best to list the best of those discounts but you still might want to check all deals. Just click on the right hand side image for more ! Hickory Smoked Spiral Hams $2.99/lb. You can also check out for some seafood for celebrating the Easter with it. There are also many good deals and big discounts on Seafoods so do not forget to check it out too ! 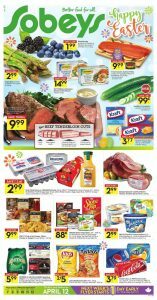 These are the best deals for today’s Sobeys Flyer April 8 2017 but do not forget to take out your coupon too. With it, you can save $5 on many products ! Also please don’t forget to subscribe our news teller for daily news on Easter for biggest deals and new flyers !